In the “History of the Christian Religion to the year two hundred,” by Charles B. Waite, A.M., announced and reviewed in the Banner of Light (Boston), we find portions of the work relating to the great thaumaturgist of the second century A.D.—Apollonius of Tyana, the rival of whom had never appeared in the Roman Empire. This is a legend which in days of old made of every remarkable character a “son of God” miraculously born of a virgin. And what follows is history. “In his youth he was a marvel of mental power and personal beauty, and found his greatest happiness in conversations with the disciples of Plato, Chrysippus and Aristotle. 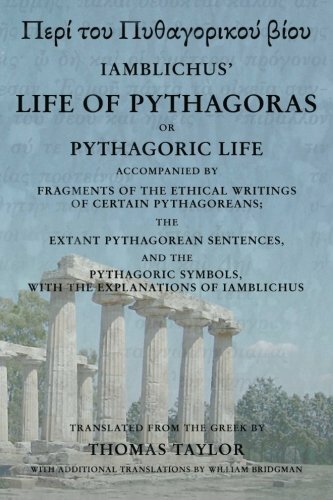 He ate nothing that had life, lived on fruits and the products of the earth; was an enthusiastic admirer and follower of Pythagoras, and as such maintained silence for five years. Wherever he went he reformed religious worship and performed wonderful acts. At feasts he astonished the guests by causing bread, fruits, vegetables and various dainties to appear at his bidding. Statues became animated with life, and bronze figures ‘ from their pedestals, took the position and performed the labors of servants. By the exercise of the same power dematerializaton occurred; gold and silver vessels, with their contents, disappeared; even the attendants vanished in an instant from sight. Some writers tried to make Apollonius appear a legendary character, while pious Christians will persist in calling him an impostor. Were the existence of Jesus of Nazareth as well attested by history and he himself half as known to classical writers as was Apollonius no sceptic could doubt to-day the very being of such a man as the Son of Mary and Joseph. Apollonius of Tyana was the friend and correspondent of a Roman Empress and several Emperors, while of Jesus no more remained on the pages of history than as if his life had been written on the desert sands. His letter to Agbarus, the prince of Edessa, the authenticity of which is vouchsafed for by Eusebius alone—the Baron Munchausen of the patristic hierarchy—is called in the Evidences of Christianity “an attempt at forgery” even by Paley himself, whose robust faith accepts the most incredible stories. Apollonius, then, is a historical personage; while many even of the Apostolic Fathers themselves, placed before the scrutinizing eye of historical criticism, begin to flicker and many of them fade out and disappear like the “will-o’-the-wisp” or the ignis fatuus. 1. Second Edition, 1 vol., 8vo., pp. 455. Chicago: C. V. Waite & Co. Thomas J. Whitehead & Co., agents for New England, 5 Court Square, Room 9, Boston.